Lou is a trial lawyer, mediator and arbitrator. He represents individuals and businesses in commercial cases of all types -- from shareholder and employment disputes to intellectual property and product liability claims. Lou also serves as general counsel and advisor to companies, partnerships and individuals. 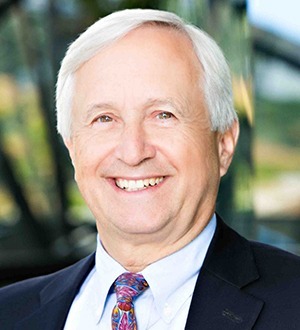 Although a significant part of his practice involves the securities industry, his experience encompasses the broadest range of activities -- from timber and airlines to biotechnology and college football. He often serves as a mediator, arbitrator, special master or judge pro tem. Lou is the Managing Principal of the firm. Lead counsel in the defense of the University of Washington in the lawsuit brought by its former head football coach, Rick Neuheisel, after he was fired by the University. Following a six-week jury trial, this case was resolved favorably for our client. Of Lou's cross-examination of Neuheisel, one columnist wrote, "Facing Peterson in a courtroom is probably a lot like standing on a beach in a hurricane while wearing hip waders. His questions were a jackhammer blast...." Les Carpenter, Seattle Times, February 15, 2005. Lead counsel in the defense of Mitsubishi Corporation in an Alaska antitrust class action arising out of the Bristol Bay salmon industry. Plaintiffs alleged compensatory and punitive damages totaling $975 million; we negotiated a favorable settlement prior to trial. Lead counsel for Weyerhaeuser Company in trial and appellate proceedings in Atlanta, Georgia. Plaintiff sought damages in excess of $850 million arising out of the carve-out of Weyerhaeuser's private label diaper division into a publicly-held company. After a several week trial, the bankruptcy court entered a $470 million judgment for plaintiff. Following review by the federal district court, this judgment was reversed, and a judgment dismissing all claims was entered in favor of Weyerhaeuser. Weyerhaeuser's victory was affirmed by the 11th Circuit Court of Appeals. Lead counsel on behalf of plaintiff Horizon Air in a trademark infringement lawsuit filed against Frontier Horizon Airlines. Following federal court hearings, we obtained preliminary injunctive relief against Frontier. Co-counsel in the defense of The New England Mutual Life Insurance Company and Copley Real Estate Advisors in lawsuits brought by the Washington State Investment Board, which asserted claims totaling $1.2 billion for securities fraud and breach of fiduciary duties. We resolved this matter before trial. Represents securities firms -- including Merrill Lynch, Smith Barney, CIBC Oppenheimer, and Edward D. Jones -- in a wide variety of securities cases before state and federal courts and before arbitration tribunals. Represents other law firms in a range of complex and highly sensitive matters. Has served as a mediator or arbitrator in hundreds of cases. I am a classically trained pianist, but these days I am more likely to play (for my own amusement) Cole Porter than Rachmaninoff. I dabble in foreign languages. My golf game needs work. A/V Preeminent Lawyer 2014, Martindale Hubbell. Repeatedly listed in Best Lawyers®, in Bet-the-Company Litigation, Commercial Litigation, Intellectual Property Litigation, and Securities Litigation. Named 2015 Seattle Bet-the-Company Litigation Lawyer of the Year.